Tossing It Out Tossing It Out: You've Been Given The Bird! Hey! Wake up dodo bird! C'mon Arlee wake up and face the music! And I'm not referring to any Battle of the Bands. While I was sleeping I was chosen as the honoree of a special event. Maybe you've heard about it. If not, I'm going to tell you about it. Cheersfest was started by Mark Koopmans last year when we roasted Alex J. Cavanaugh. Yeah, we all had a fine time with that. Now I'm in a fix and you all are in the driver's seat. Time to dish it out to the Bird and I ain't talkin' turkey. It's time for the second annual Cheersfest blogger roast and I am this years roastee. Come on and give me the business. Have fun while you make me squirm. "They like me! They really like me! Or wait maybe they don't like me. I don't know whether to laugh or cry. Maybe I'll cry. Everything's a blur." So began the inaugural CheersFest (aka AlexFest) when our Ninja Captain, Alex J. Cavanaugh, was roasted and toasted in December 2012. Everyone, including A-Cav had such a great time that we’ve decided to do it again. On his main blog, “Tossing It Out,” Lee describes himself, in part, “as a writer, speaker, entertainer, music lover, collector, husband, father, grandfather, friend, traveler, seeker of truth and wisdom.” He majored in English while at the University of Tennessee, has blogged since 2008, and currently has six blogs that delve into his diverse mind. The original brains behind the annual A to Z Challenge, Lee can be counted on to pay it forward and is a well-respected member of the blogging community. Hosted again by Mark Koopmans, Morgan Shamy, David Powers King, Stephen Tremp and The Ninja Captain himself, CheersFest 2.0 will go LIVE! Dec. 9, 2013. · Why did Lee come up with the A-Z Challenge? 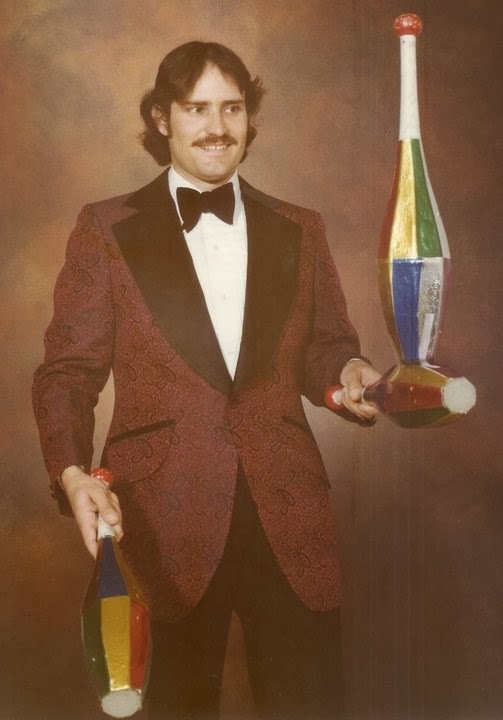 · If someone dreams about being a juggler, what does it mean? · Is a post by Mr. Bird worth two in the bush? · In +/- 40 words, can you come up with a caption for Lee’s Facebook picture? · Post your 200 (total) word contribution ON Monday, Dec. 9, 2013. · No, seriously. Have Fun! There Will Be Big Prizes! · An autographed color photo of Arlee Bird appearing as the Court Wizard in the World of Fantasy Players production of The Magic of Cinderella. Also included in the first prize pack is an assortment of promotional materials from Lee’s show biz days with a personal letter and a brief history of his entertainment career. Okay so I don't have a book to autograph and I'm not going to be baking cookies. But the prizes will still be fun! So are you ready to face the Blogman? C'mon now--no excuses. It'll be fun! Not going to be around? You can always preschedule your post. And it doesn't have to be some literary masterpiece. Just hack it out if you need to. The more entries we get, the more work I have to do. You want me to work don't you? Mini-Alex on Vacation, Upcoming Events, Ninja News, and the Big News - CheersFest 2.0 Roastee!!! Are You Looking for Numbers on Your Blog? Was there ever any doubt who the next person would be? And it will be so much fun to be on the other side of the roasting this year! Just wanted to pop over and congratulate you on being the recipient of the roast, and I'm not talking Prime Rib. :) You'll have a blast. Congrats! Too fun! You know I'm on board for this one…who can resist such an excellent prompt for a good flash fiction story, after all? Congratulations, Lee. Wish I knew you better too. But I know you have a sense of humor. At least, I hope so. Alex -- Hope everyone has fun. ML -- I sure I'll be getting a prime rib from everyone. Just so it's not chopped liver. Desert -- You can always make things up. Who would know? MJ -- I've gotta see how the "brown jacket" is going to play into the stories. Robyn -- I probably have more of a sense of humor than most readers realize. When I'm aiming for funny I think a lot of people think I'm being serious. This does sound like some serious fun, I'm sort of tempted to give it a go myself! I'm in! This should be lots of fun. Oh, and I noticed that you gave permission above for people to make things up... am I right? I've added my name to the Roasting list. I'll try to be considerate. . .
Look at it this way, Lee, by consenting to be on the hot seat, you will prove forever that it takes a lot of ingenuity to cook a smart bird. No way. Too new to the neighborhood. You'll just have to wait until I properly judge how to snark you ( the last one about spamming didn't fly the way I hoped...). I look forward to reading everyone's posts that day! Congrats Lee on being the Roastee. I am still pondering the rules of participation to see if I can come up with anything good. If so, I will happily put you on my spit. Yeamie - Sure, you might as well! Michelle-- You can make things up. I made up things about Alex last year. Or did I? DG - Do you mean smart as in intelligent? Or some other kind of smart? CW - Maybe I answered the spam comment too seriously? JoJo -- Don't just read! Dish out your own bit of fun. Robin -- Let me think about that spit a minute. That could mean a couple of things. Maybe more seriously than you would have had you read my post yesterday beforehand... but that would make you a time traveler, and who wants to go to the future? Hi Lee .. it's going to be so much fun - you deserve to be roasted with champagne and lots of toasting for all the work you've put in to the A-Z .. I shall enjoy reading .. and if I'm around I'll be joining in the fun ..
have they lit the fire yet - so we have some excellent coals to watch you juggle to?! Aha and you are the perfect candidate to be roasted. Of course, even though I was asked to be part of it, well, you might realise my dismay when it comes to these gosh darn blogfests. Even so and more irony, I shall discreetly promote this celebration of your good self. CW -- I'd rather go to the past. I go a bit farther into the future every day. Sia -- I try to have fun in everything I do. Hilary-- I'll take a glass of that champagne. Gary -- It's not a blogfest, it's a roast. Feel free to zing some zingers. Beer-- I can hardly wait. Wow, I haven't heard of this until now. Looking forward to your big day Lee! You really deserve this special honor, and I know that it will be fun! Jennifer -- It basically just was announced. Susanne-- I could use some loving. Mark-- Eggs-so-stenchful? How appropriate for me. I'm a big fan of existentialism so might as well adapt the philosophy to the birds. Julie -- It will be interesting to see what folks come up with. Hmm, not sure I know you well enough to roast you. Oh I can't wait. You deserve this Arlee and whether hugged or roasted remember we still love you. I've left a link, but suspect it will be a broken one! This one will work better on the day. Jo -- You don't have to know me that well. Just pretend like you do. Sheena -- Aw, that's sweet of you to say. Sue CT-- That's alright, it's for the Bird. You can wing it.